Rabbis and all spiritual leaders spend a lot of time on God. God is the main character of the Torah and all the other books of the Hebrew and even the Christian bible and the Muslim Quran. The majority belief is a Theist belief, where God exists, is self-aware, lives in Heaven – outside of time and space and is the Creator of the Universe and everything in it. The Theist believes that God sets the standard for human behavior and then judges us, meting out reward or punishment based on our behavior. That, in part is why we are sitting here today, as we begin the 10 days of reflection and repentance. To the Theist, God controls everything and everything that happens is according to God’s will or plan. For many, this explains a lot of what happens in the world and how through prayer, perhaps God can be influenced to make things work out the way the worshipper wants it to work out. However, there are other theologies that are equally as valid, though challenging for the majority. For example, the agnostic is not sure what to believe about God; they feel there is not enough evidence to prove or disprove the existence of God, so they keep an open mind about the Great Mystery. Whereas, a theist has faith in the existence of God, the agnostic feels there is not enough proof. There are others who do not believe in a God out there somewhere, but rather God right here in the physical world, in everything and everywhere – even in the Great Mystery. That is the God I would like to discuss. The God in which I believe. 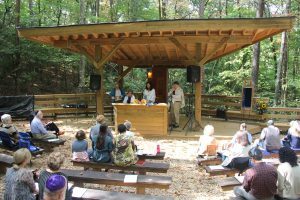 As Rabbi Rami Shapiro writes, the panentheist believes that you and I and all reality is not separate from God, yet the core of creation resides in God. Therefore, if God is Creation and God is reality, then humans are God manifesting as humans. Let’s draw from both the theist view and the panentheist view, that God exists as a great Mystery, yet also focus on the view that God is within everything, especially us. My evidence of this is: love, acts of lovingkindness and compassion that reside in the human heart. This premise assumes that a human being, somewhere along the spectrum of normal mental health has full access to love, acting from a place of kindness and being compassionate – serving others and doing for others. Recent events are my proof of this. While in a Publix, I witnessed a man walk up to a family from the middle east. The mother and the older girl had their heads covered in scarves, so it was apparent that the family was Muslim. The man walked up with a smile and his hand extended to the father. He asked, “where are you from?” The daughter translated and the father, at first looking nervous, responded, “we are refugees from Syria.” The man replied to the daughter with a huge smile, while looking at the father, “I’m so glad you made it here… you are what makes America great.” The father than softened his fear of non-acceptance, and beamed back with a huge smile. Let’s go back over the past few weeks to Hurricanes Harvey and Irma. We saw many, many people from Louisiana nick-named the “Cajun Navy” drive their fishing and gator boats in caravans to Houston to help rescue people trapped in their homes. Many other local people with boats or rafts did the same. In Rockport, TX, Big Tex Lawn Service, a landscape and tree company from San Antonio worked tirelessly and for no fee to cut up downed trees. Others who came from out of state manned grills and cooked hamburgers, hot dogs, barbecue, rice and beans and other food for the local Texans, who had lost everything. These volunteers were not asked to do this – they felt compassion in their hearts – the God within and took action. I saw on Facebook many, many postings about people willing to house complete strangers who were fleeing their flooded or destroyed homes in Texas and Florida. During Hurricane Irma, at a crowded rest stop just inside the AL border from FL, many volunteers were handing out free water. Others were BBQing hamburgers and hot dogs, along with all the sides. They gave it all for free to hungry/weary evacuees. These volunteers were selflessly working on a hot day for the benefit of others – all strangers from FL escaping the ravaging hurricane. I say all of these acts of loving-kindness and compassionate outreach are evidence of the God within. When we clear away our negative thinking, do not give in to our inner wounding and tear away our masks and covering-up personas, what is left is our truth – our inner being, our Light. While we are all unique and have our own gifts to share, at the core is always love. Love is universal and human beings were created to love. We are here for each other. And if I am only for myself, then what am I? Let’s break these down – If I am not for myself, who will be for me? And if I am only for myself, then what am I? Hillel is grappling with the balance between selfishness and selflessness. We all struggle with this from time to time. However, it does not need to be an either / or. When we make it a both/and, we can be for ourselves, through self-care and then when needed, be for others whenever possible. Leviticus 19:18 implores us to “not avenge, nor bear any grudge against the children of your People, but you shall love your neighbor as yourself; I am the lord your God”. 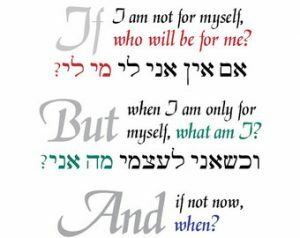 Thirty-three times, the Torah text ends with the phrase, I am the lord your God. To many, this implies that by doing the act just prior to this ending phrase, we are manifesting God. Again, with the text ending with, “your God”, this implies that to not avenge, to not bear grudge is really about us dealing with our own stuff so that we don’t project our stuff onto others. Only then can we love the other. It comes down to nurturing the God within us so that we can nurture the God in others. Then, the natural consequence is compassion and acts of loving kindness. Martin Buber, the German Jewish theologian wrote, when we treat the other as a “thou” instead of an “it”, we are treating them like God. Imagine a world where we treated each other as if we were all God manifesting as each other? If we are all God manifesting as us, then how can we treat each other any other way? However, we know that there are many challenges to loving not only ourselves, but loving others, especially when the others come from a place of hatred and bigotry. This past few months has been difficult for our nation and for our Jewish community. The vocal presence of white supremacists and neo-Nazis throughout the US is bringing up a lot of fear. However, we must continue to advance our audaciously hospitable philosophies and actions, even more so than when things are calm, and (relatively) easier in the world. Our teachings say: “When love is strong, we can lie on the edge of a sword.” And so, it is with us. The way to respond to the suffering and evil in the world, is with love, inclusion, and compassion in our communities. Instead of circling the wagons, learn to be an ally, stand for something, not against something. Instead of assuming our perspectives are the whole story, be mindful of others’ lived experiences. Instead of isolation, reach out to establish deeper connections with all people around you. Instead of assuming people feel safe in our physical spaces, actively seek to make them feel safer. Instead of being afraid to ask questions, seek answers for what you don’t know about identity and difference. Instead of pushing away those who honestly seek connection, embrace personal vulnerability as a tactic for finding empathy with others. Seek to grant kindness to those around you – and especially to yourself. Much hatred and bigotry is the result of childhood deep inner wounding and fear. Yet love can overcome hurt and fear. There are many stories of neo-Nazis, who when shown kindness by Jews or other minorities, began to thaw their frozen hearts. I recently heard on NPR an interview with a man who was terribly abused and bullied as a child and was drawn to white supremacy because it made him feel powerful and gave him a sense of belonging. However, while in jail, he experienced the kindness and outreach of those he hated, left white supremacy and now operates a non-profit to counsel and bring back other white supremacists and neo-Nazis. This is an example of self-love growing out of self-loathing, which then transformed into loving outreach to save others. We can learn from the Dalai Lama. His love is universal and comes from who he is. He lives it. He even laughs at himself. He radiates love and compassion. Self-esteem is a natural outcome. From this self-esteem comes the abundant love and compassion that he shares. The Dalai Lama has said, “My religion is kindness.” There is the face of kindness and non-judgment that radiates love and self-esteem in many ways. Love is reflected in love. It is effortless when coming from someone with genuine self-esteem. Fear makes our hearts close off or harden to protect against pain. Because love is the opposite of fear, as fear diminishes, love grows. Your gifts—whatever you discover them to be— can be used to bless or curse the world. Any of these can serve to feed the hungry, bind up wounds, welcome the stranger, praise what is sacred, do the work of justice or offer love. Any of these can draw down the prison door, hoard bread, abandon the poor, obscure what is holy, comply with injustice or withhold love. You must answer this question: What will you do with your gifts? The choice to bless the world is more than an act of will, a moving forward into the world with the intention to do good. It is an act of recognition, a confession of surprise, a grateful acknowledgment that in the midst of a broken world unspeakable beauty, grace and mystery abide. And while there is injustice, anesthetization, or evil there moves a holy disturbance, a benevolent rage, a revolutionary love, protesting, urging, insisting that which is sacred will not be defiled. Those who bless the world live their life as a gesture of thanks for this beauty and this rage. The choice to bless the world can take you into solitude to search for the sources of power and grace; native wisdom, healing, and liberation. the life of ritual and praise, the comfort of human friendship, the company of earth the chorus of life welcoming you. None of us alone can save the world. Together—that is another possibility, waiting. Copyright © 2018 Shalom b'Harim, Inc., All Rights Reserved.